As a genre, cyberpunk is exploding with popularity, realizing a resurgence after its 1980s boom. There are plenty of games popping up using it as a general theme, as the style lends itself well to our high def screens. 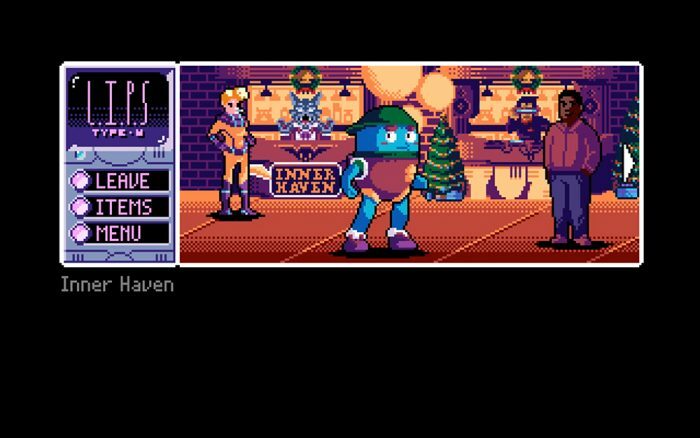 But the narrative aspects of the category can be just as interesting, and that’s where 2064: Read Only Memories INTEGRAL focuses its efforts. Narrative is undoubtedly the core of the experience, above almost all other action, and it pays off in a charming little adventure, albeit one that misses a couple of opportunities on the Switch. 2064: ROM INTEGRAL is an enjoyable game, reveling in the genre and its thematic clashes of technology and social issues, addiction and necessity. It’s certainly a 1982 view of the future, and thanks to some great storytelling it’s also very easy to follow. It’s light-hearted, and rarely dips into drama, but the variety of characters and their personalities are memorable and add depth to the experience. Based on classic PC point-and-click adventure games, Midboss’s 2064 is designed around a series of static scenes that we interact with, looking for clues or talking to people (and robots) that may help us find a lost friend. It sometimes feels like a hidden object game, tasking us with clicking around endlessly until we highlight something that is of value. There’s always a definite solution that isn’t too tough to get by and moves us along. Integral is the definitive version of 2064, finding a home on a Nintendo platform for the first time. It includes a new prequel episode, galleries, music and more. On a big screen it looks and plays just like every other version, but there are a couple of bothersome quirks when playing on a Switch in handheld mode. For one, the text tends to overpower most of the screen, shrinking the rest of the visuals a bit and throwing them off-center. It makes the effective scene smaller. Another annoyance is that there isn’t a touch option in this mode. Instead of using an analog stick or a d-pad, it’d seem much more intuitive to tap what I wanted to look at. 2064: Read Only Memories INTEGRAL is a solid little game. It’s clearly geared towards those of us who might enjoy pacing more than action, or short stories more than blockbuster features. Either way, it has a nice mix of elements that combine into an experience that can be enjoyed in a single sitting, especially for those with nostalgia for the neon Eighties. This review is based on an eShop code sent to SideQuesting by the publisher.